We northern gardeners do something that southern gardeners don’t do. We put it all away. Containers, pots, furniture, decorations, hoses… to have them last more than a season or two, we must put them away each fall, or at least stow them somewhere safe where they won’t get pelted with sleet or covered by snow. Otherwise, winter would destroy it all. In fact, figuring out where we would store something in the winter becomes a factor in deciding what to buy for the garden. At least, I think about it. That’s why when I see some of the stuff put into “garden rooms” in southern gardens, I just laugh. Where would I put all of it in the winter time? I've stopped hauling stuff from the backyard around to the front to put it in the garage for the winter. That’s a lot of work, Plus, I ran out of room in the garage years ago. The garage is stuffed full year-round with all kinds of gardening tools and other gardening essentials that one might normally store in a shed or barn. Not to mention I manage to keep a car and truck in the garage all year long. 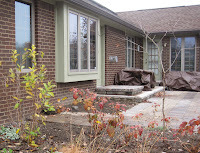 I stow most of the garden stuff under tarps on the back patio, if it can stand the cold weather if it is kept dry. It’s not terribly attractive and always reminds me of Jed Clampitt’s truck loaded up to go to Californy, but it works for me and saves me both time and effort. With everything now stowed under tarps on the back patio, I’m in pretty good shape when it comes to winter readiness. All the bulbs are planted, too. There are some perennials that could still be cut back, but if I don’t get around to doing that, “no biggie” as they say. It would just mean more seeds for the birds to eat this winter, and more seedlings for me to weed out, or giveaway, this spring. In other words, if it snowed tomorrow, I wouldn’t freak out. So bring on winter. It’s going to happen. I’m ready. Almost ready. The Troy-Bilt snow thrower is being delivered on Monday. Once I get that, then I’m really ready. If you want to win a snow thrower, enter the giveaway by November 25th at 9:00 pm EST by leaving a comment on that post. It's a great feeling to have it all cleaned up & put away. I'm like you, I think about if I have room to store something over the winter before I buy it. That's why I like the fake terracotta pots. I always think the task of taking down our Casa is the most sad chore of the season. Taking it down makes the garden feel empty. Yet, when it is tucked away in the yard barn I feel like I am ready for winter. You're so right. Cold weather can be a useful constraint, one I've never known. I've had to build up self-restraint to curb the urge to collect things for the garden. The stuff can accumulate fast! Must be a great feeling to be ready for the winter. I still have pots to bring in. I am waiting for a nice day or for the weatherman to predict snow accumulation. I'm certain my neighbors wish I could load it all up and stow it away until spring. Alas, the bare branches of my perennials must remain, all pathetic and flowerless. I don't dare prune now, lest the plants get the idea it's spring on one of our 70-degree days and put on new growth, only to freeze the tender leaves off a week later later during a cold snap. That's life in our Central Texas gardens fer ya. Wanna trade? boy do you look cleaned up and prepared! All around, I've got dead yellow things, broken pots that are broken and cracked b/c I didn't get them in last year either, the rain barrel is overflowing. I need to do some work for sure. Cars in garage: check. Tarps deployed: check. Pots, etc. put away for winter: check. I'm ready, too. Actually, I'm getting a bit lazy. I gave away all the terra cotta and am making do with containers made of more durable (and less heavy for the annual "put away" dance) materials. Glad to hear I'm not the only one that rolls my eyes at the spreads in the magazines. I have just about cleaned up the last bits - and put them into my new lean-to shed that the men in my family built for me this fall. I don't have a garage and my husband had filled his tractor shed beyond full! Now my new shed is really full, but the landscape looks beautiful.